Note: this post was first published on July 23 and again on August 15th. Just days ahead of IFA, we’ve updated the post one last time, adding a few more details and changing a few outdated assumptions. It’s hard to believe, but 2014 is already a little over half of the way through, and what a year it has been. So far we’ve seen some pretty impressive flagship handsets from Samsung, HTC and LG, as well as some other interesting mobile announcements including Android Wear, Android Auto and Android L.
The year might be in it’s second half, but there’s still plenty to see. Easily one of the biggest Android-related announcements of this year will be the unveiling of the Galaxy Note 4 at IFA, now only days away! As the date approaches, we have already seen the rumors related to the Note 4 intensify and while much is still uncertain, we’re starting to get a fairly clear picture of what (we think) the handset will bring to the table. With that in mind, let’s take a look at some of the most prominent rumors related to Samsung’s upcoming flagship to get a better idea of what to expect this week! Going back at least a couple years now, just about every major Samsung device has been surrounded by rumors claiming that the Korean giant will make dramatic changes in terms of its outer design language. The reality, at least so far, is that Samsung has dabbled around with slightly different plastic textures but largely kept the device’s looks the same as ever — with the exception of the Galaxy Alpha at least. With the Note 4 we are once again met with reports that Samsung is doing something different, though given the track record of these types of rumors, it’s hard to approach the claims without a hefty dose of skepticism. So what design changes does the rumor mill suggest the Note 4 will receive? First, there has been at least a few persistent rumors indicating the company is finally switching to a metal design on at least one variant of the device. Korean media source ET News even goes as far as to claim Samsung is experimenting with stainless steel, aluminum and magnesium for the Note 4’s build. 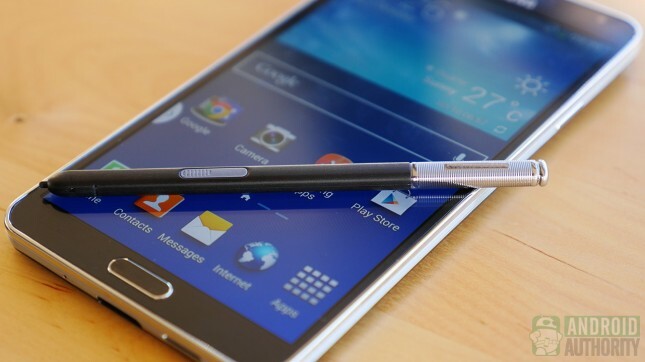 The image below allegedly represents the Note 4 sporting what looks to be a metallic frame. If legit, the Note 4 will be similar in appearance with the Galaxy Alpha, while maintaining the faux leather texture of the Galaxy Note 3. In addition to offering up more premium materials for the Note 4, the rumor mill also says we could see both flexible and non-flexible options, with the former perhaps serving as an unofficial successor to the Galaxy Round. According to one report, Samsung is already manufacturing the plastic-based flexible display for a three-sided version of the Note 4, though it’s not clear if said version will be released alongside the regular Note 4 or sometime later. 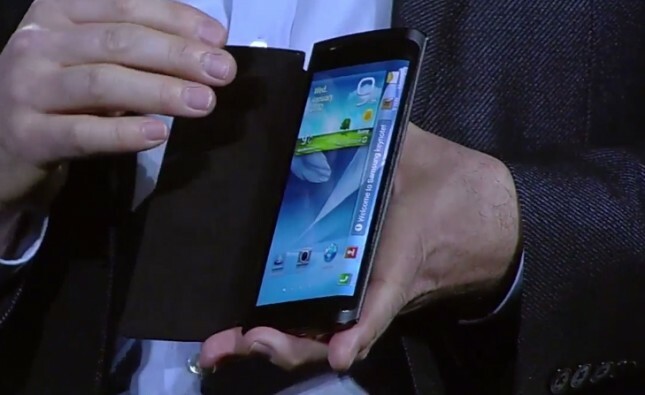 If and when it comes out, this three-sided display model could be called Samsung Galaxy Edge. So how credible are these rumors? Honestly, it’s hard to say for sure. Given how many times we’ve heard this song and dance before, it’s best to be cautious about these lofty claims, but in many ways they make sense. With increased competition from metal phones and even LG’s push towards a metal-like plastic design, it seems that the time could (finally) be right for change. This is especially true when you add the fact that Samsung recently posted its worst quarterly earnings report in two years and Apple’s arguably more-premium iPhone is rumored to soon make a jump in screen size that could allow it to compete more effectively with Samsung’s offerings. On the other hand, Samsung might not be ready to push the flexible screen revolution another step forward and there are reasons why the firm would still want to keep away from a metal design. Probably the biggest reason at this point for keeping away from metal is that Samsung consumers like the fact their phones have removable backs and batteries in a world where most devices no longer offer this option (though this is starting to change). Creating a functional removable metal back is a very real design challenge, though they could simply keep the plastic back and go for a metal frame like the Alpha. Even if Samsung makes a change to metal, it’s all but guaranteed the traditional button layout will largely remain largely the same on the front. Outside of the claims of new build materials and flexible displays, the rumor mill also suggests that the handset could see other visually noticeable changes such as new sensors including a fingerprint reader, heart-rate monitor and a UV radiation sensor. The handset is also said to reportedly pack IP67 water/dust resistance. When the OG Note debuted, it packed a 5.3-inch display, which at the time seemed gigantic when compared to most other flagship mobile devices. Since then, the Note series display size has continued to creep upward, first to 5.5-inches with the Note 2 and then up to 5.7-inches with the Note 3. If you already feel that the Note’s size is more than big enough, you’ll be happy to know that this year’s Note 4 is reportedly sticking to the same 5.7-inch AMOLED display size. Of course, just because the resolution is the same doesn’t mean the screen’s quality isn’t improving. Following in LG’s footsteps, the Note 4 is believed to be making the jump to QHD (2560×1440). While some feel that QHD is overkill, it seems only a matter of time before this resolution becomes the standard for flagship devices in late-2014 and into 2015. As we’ve seen with many Samsung flagships before it, the Galaxy Note 4 will launch with at least two different processor configurations: one with a Snapdragon 805 CPU and the other with an Exynos 5433 octa-core processor. In the past the Snapdragon model has generally been used for the North American market and a few others, with the Exynos version used in several international models. It is worth noting that, this time around, both processor packages offer support for LTE. A retailer in Indonesia put up an early listing (image below) of the Note 4, claiming the device would feature 4GB of RAM. It remains to be seen if that will be the case; it’s possible that different Note 4 versions will have different amounts of RAM. The Note 4’s camera is expected to be a 16MP shooter with optical imagine stabilization and will have a Sony-made IMX240 sensor. There’s also reportedly a side touch sensor on the Note 4, which could mean that you’ll be able to tap the side of the Note 4 to take a photo. Again, this is an unconfirmed feature. There’s also said to be several new camera modes making their way to the Note 4, including three selfie modes: wide selfie, selfie (which lets you take a shot with a smile or wink), and Selfie Alarm — the rear cam focuses on your face when you try to take a self portrait. There’s also said to be a GIF making mode that wil lconvert shots taken in burst mode into animated GIFs. Of course you can also expect all the camera software features from the Galaxy S5 to make a return here as well. The Note 4 will launch with Android 4.4.4 KitKat with an eventual update to Android L. It remains unseen whether that update will come in 2014 or 2015, but we’d guess the latter. As always, you can expect Touchwiz to be present as well, and likely many of the apps and features from the Note 3 and GS5 will end up in the Note 4. Starting with the Galaxy S5, Samsung has been marginally scaling back the number of special features and apps added to Touchwiz and, while we imagine that there won’t be any major overhaul to Touchwiz, it seems likely that we could see Sammy continue to push this ‘back to basics’ approach. That doesn’t mean they won’t be adding anything new, though. For starters, a new S Health app function will be introduced that is designed to utilize the Note 4’s UV sensor. The idea is that the Note 4 will be able to tell users when the UV index reaches harmful levels and will give them recommendations (like applying sunscreen). While kind of cool, it’s also pretty gimmicky and, unfortunately, doesn’t happen automatically. Instead, you’ll have to hold the phone at “over 60 degree angle of elevation towards the sun against the back of the sensor”. Aside from this, we’ve also recently heard details regarding new software features that will take advantage of the Note 4’s integrated fingerprint reader. Not only will the Note 4’s reader offer all the features seen with the GS5, new features will include Fringerprint shortcuts that let you assig a shortcut to a specific app’s function. For instance, swiping your index finger could take you straight to the camera, while using your thumb would unlock the phone as usual. Web Sign-in is another new feature mentioned by leaksters that lets users match credentials to a fingerprint, making it easy to log into compatible web services with a finger swipe. This will presumably only work with select services, though not a lot of details are known just yet. At IFA 2013 we saw the launch of the Galaxy Gear alongside the Note 3. While the company’s first watch didn’t do all that well, this didn’t stop the Korean giant from launching a successor alongside the Galaxy S5 earlier this year. So will the Note 4 also see some sort of companion? While it seems a bit too early for a Gear 3, we’ve heard several rumors suggesting that Samsung is preparing at least one companion device for release at IFA. So what can we expect? It depends on which report you look at. 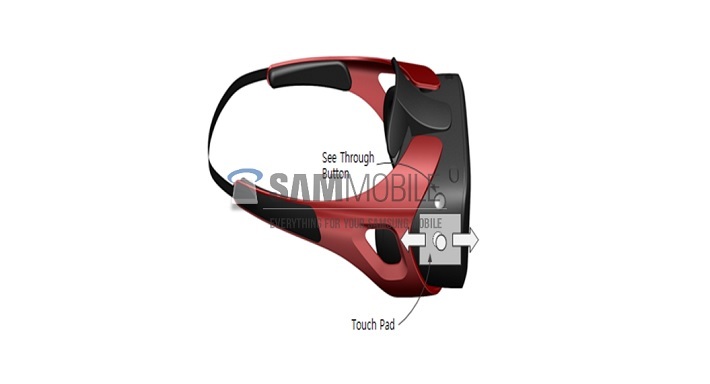 Initially, we heard that the rumored Gear Glass would be shown off, and then there was talk about the Gear VR. Finally, the most recent report claims we’ll see a Gear 3 watch, as well as a SIM-equipped Gear Solo. It’s hard to say which of these reports, if any, are correct. Perhaps they all got it right and Samsung is launching three new wearable devices alongside the Note 4? Anything is possible. We’re positive that the Galaxy Note 4 will be introduced to the world on September 3 at Samsung’s traditional Unpacked event. There are rumors claiming Samsung is accelerating the release date of the Note 4 this year, and we may even see the device out by mid September. It’s almost inevitable that some of the rumored changes and features we’ve reported on won’t actually make it into the final Note 4 hardware, though most of what is mentioned above has been featured in more than one unofficial report lending a little more credence to the claimed specs, features and even design changes. As IFA draws closer we expect even more juicy rumors to pour in, so we’ll be sure to update this post with the most probable rumors and leaks as they hit. Based on what we know so far, are you excited for the Note 4 — what features and improvements are you most interested in seeing?